Recipe by Jenny Shea Rawn, My Cape Cod Kitchen. Add coconut cream to a medium mixing bowl. Using a handheld mixer, beat coconut cream for 1-2 minutes until light and fluffy. 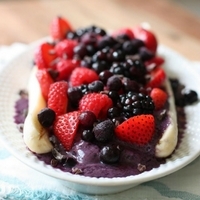 Add 1 Tbsp frozen Wild Blueberries to the bottom of each of 2 glasses. 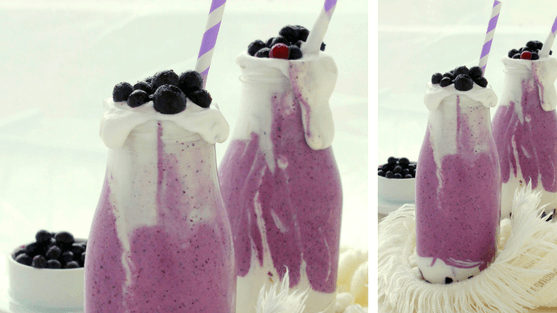 Top Wild Blueberries with 2 Tbsp coconut cream in each glass. 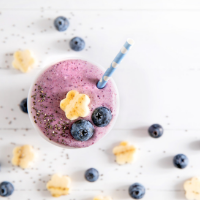 In a blender, combine remaining frozen Wild Blueberries, milk, kefir, walnuts, chia seeds and maple syrup. Pour equally into 2 glasses. Top glasses with remaining coconut cream. Using a spoon or straw, give the coconut cream a swirl into the smoothies. Top with a few additional frozen wild blueberries for garnish, if desired. Serve. Note: you can also blend the full 14 oz. can of coconut cream to make a large batch of coconut whipped cream and keep it in the fridge for a few days to use in other smoothies, coffee or as a dessert topping.